Unlike brands like Etude House or Tonymoly the Korean high-end brand NoTS is yet not widely known among people outside Korea. 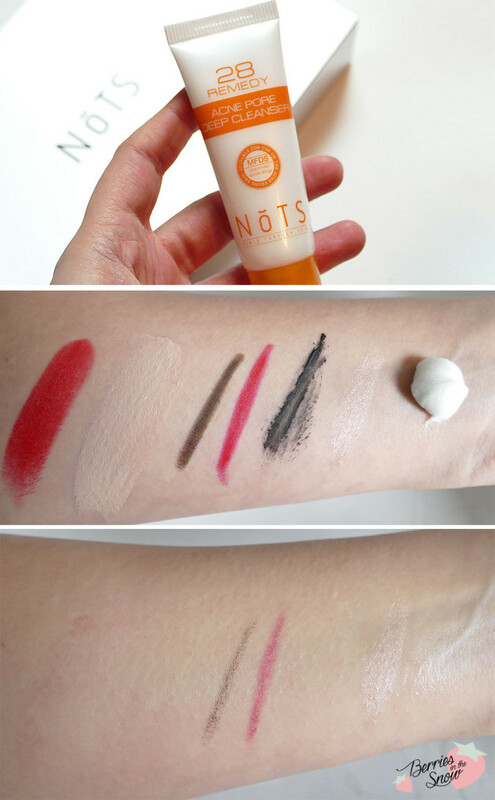 NoTS stands for ‘noble through skin’ and was founded in 2011. It is supposed to be natural functional cosmetics with eco-friendly ingredients. Since it is a high-end brand the products are more expansive than drugstore brands like Etude House or Tonymoly. Their packaging design is also not girlish or fun, but more mature and targeting another age group than the two other brands. 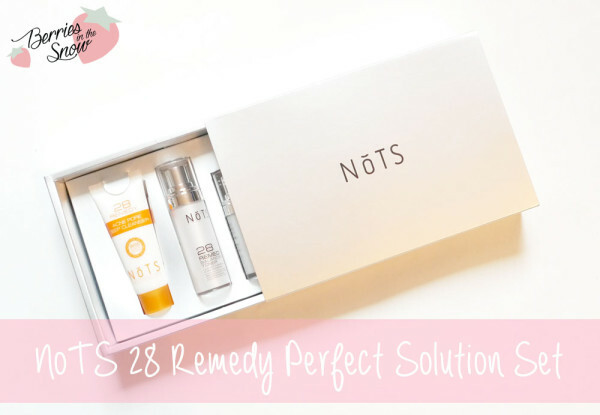 The NoTS 28 Remedy Perfect Solution Set comes in a silver cardboard box and contains 4 products. 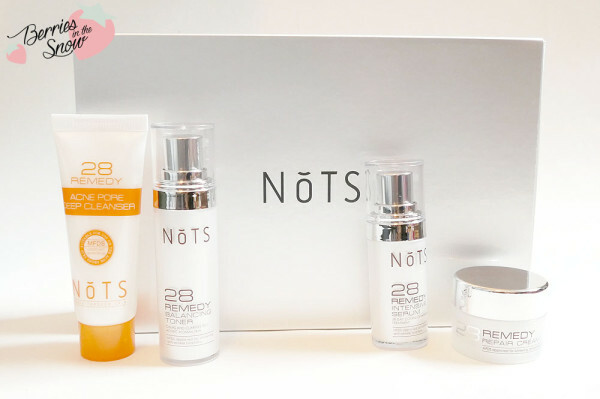 The NoTS 28 Remedy skincare range is made for sensitive and acne prone skintypes and is a multipurpose range targeting also anti-ageing and having whitening properties. The set contains the NoTS 28 Remedy Acne Pore Deep Cleanser, The NoTS 28 Remedy Balancing Toner, The NoTS 28 Remedy Intensive Serum, and the NoTS 28 Remedy Repair Cream. 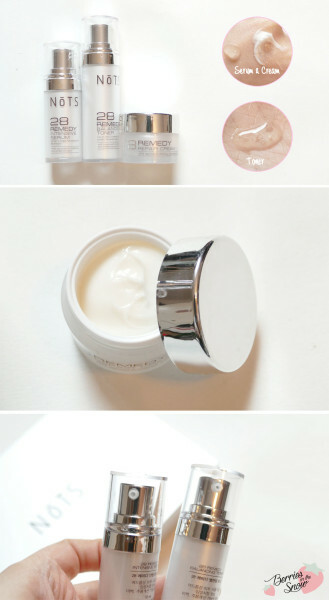 These four product already build a perfect tiny skincare routine. From the 4 products the cleanser stands out most, because it has orange-colored fonts and cap on the white plastic tube. The other three products are simple but elegant. The bottles and jars have a white color and silver fonts and caps. They are made of hard plastic and seem to be very sturdy and perfect for travelling without fearing for them that they’ll break or leak. The backside of the silver cardboard box reveals the Korean description for the 4 products, but you can check Qdepot for English description of the single products. The first step of your skincare is usually a cleanser. The NoTS 28 Remedy Acne Pore Deep Cleanser is a cleanser containing salicylic acid. It also contains a bunch of plant ingredients. All in all there are some minor irritants within the ingredients list, but the formulation is color-, scent-, and alcohol-free. The deluxe size comes with 25 ml volume, whereas the full size contains 120 ml. The foam cleanser has a white consistency and a pH of 7 when mixed with water. It cleans of almost all the makeup as you can see in the picture below. It is a bit weak towards lipliner, eyeliner, and smudgeproof eyeshdow formulations, but it cleans nicely the BB cream. The cleanser builds a soft foam when lathered and doesn’t have any specific strong scent. After cleansing your face you would use the NoTS 28 Remedy Balancing Toner and the NoTS 28 Remedy Intensive Serum. Both products come in bottles with a pump applicator, which is very convenient to use. The toner contains 15 ml in the deluxe sample size and 100 ml in full-size. It is a clear toner with a light gel texture. It is not completely watery when pumped out of the tube, but when spreading it the texture feels watery. It has a faint alcohol scent and the ingredients list reveals that it includes alcohol. Apart from this the toner contains many plant derived ingredients. Unfortunately, it contains Triethanol amine and Triclosan, which are red labelled according to COSNDA. Especially since it contains Triclosan I wouldn’t recommend using it because Triclosan is highly discussed and already banned in many cosmetics (in Europe). The NoTS 28 Remedy Intensive Serum is used after the toner. It also comes in a pump bottle containing 12 ml for the deluxe sample and 35 ml in the full-size. The serum is clear and like a gel. It also contains alcohol and has a faint alcohol scent like the toner. Apart from this the other ingredients look good. Similar to the toner the gel formulation melts like water when spread and therefore absorbs quickly and feels refreshing. The last step of your skincare routine would be the NoTS 28 Remedy Repair Cream. The cream comes in a jar containing 10 g, the full-sized jar contains 30 g. The cream has a thick, creamy consistency and a strong herbal scent. It contains a whole bunch of plant derived ingredients, similar to the serum, and also contains Niacinamide and Adenosin. The cream also contains some red labelled ingredients according to COSDNA, which are Triethanol amine and BHT. And it also contains Salicylic Acid, and some minor irritants. It also contains Zinc Oxide as UV protection, which is great. The cream applied nicely on the skin, but leaves the skin a bit tacky first. There is no greasyness though. The strong herbal scent lingers quite some time unfortunately. It is nice that these kind of deluxe sample sets give us the opportunity to try out a whole range of new products. Out of the 4 products my favorite is the serum. I wouldn’t recommend using the toner because of the Triclosan. The cream has a very intense herbal scent and it is kind of bitter, too. Also, for a high-end brand it contains too many irritants and not so great ingredients. The cleanser is probably a good choice for oily skintypes and acne-prone skin, because of the salicylic acid. For me it was too drying, and since my skin is dry anyways it is not the perfect cleanser for my skintype. Also, considering the higher prices of NoTS products I would advice you to get some samples of the products from this range before, since they may contain irritants. You can get the products at Q-depot. The Cleanser retails for 26.88 US$. The Toner is available for 67.20 US$. The serum costs 75.60 US$, and the cream retails for a proud 102 US$. Q-depot is an online retailer for Korean cosmetics. They have already quite a variety of the most popular Korean brands and they keep adding products frequently. The site is easy to navigate, too. And they offer free samples for each order and free shipping for orders above US$ 69. What I like especially, that they have an extra section for cruelty-free products, which contains brands like Iope, Innisfree, Etude House, etc. I didn’t see that before for most of the online stores, so that’s something really innovative and nice. Also, they are committed to contributing 3% of their group’s net profit for social causes in different countries. So you can shop for your favorite Korean products and do something good, too. Also,Q-depot is having a promotion were you can get 25 US$ coupon upon signing up. The coupon is useable for a minimum purchase of 69 US$.